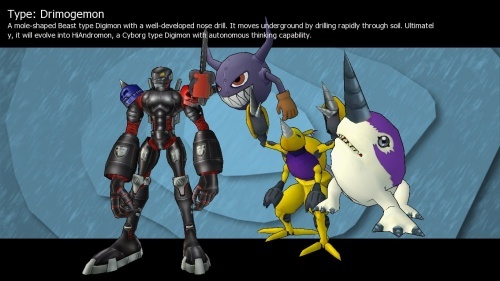 Drimogemon is a Beast Digimon. His name comes from drill and "mogura", the Japanese word for mole. He looks like a giant mole with a huge steel drill at the end of its nose (and smaller versions of it as nails for both hands and feet). They are known to live underground. Drimogemon are great diggers. HiAndromon HiAndromon Boss Card Levels: ¿? Hyour the opponent strongly with its paw. Uses the drill on its nose to hit the opponent. 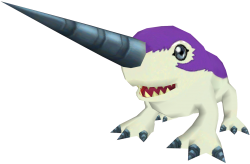 A mole-shaped Beast type Digimon with a well-developed nose drill. It moves underground by drilling rapidly through soil. Ultimately, it will evolve into HiAndromon, a Cyborg type Digimon with autonomous thinking capability. This page was last modified on 19 March 2018, at 04:16.